Range: Southern half of Canada and Northern half of the lower 48 states. The average weight of a chickadee is equivalent to a nickel, dime and quarter put together. The black-capped chickadee has a white edging on its wings where its relative, the Caroline chickadee, does not. In late summer into early fall the black-capped chickadee will form into small flocks. The flock will be led by a dominant pair. This dominant pair usually has just finished a successful brood. The flock of chickadees will defend and occupy their non-breeding territory together. This social behavior is unusual and is not done by any other common bird. The flock of chickadees will also establish a feeding territory. The dominating pair is easy to recognize at feeding time. The dominant pair will immediately approach the food source, while the followers in the group will wait until the dominant birds finish. Chickadees are often found feeding at feeders in suburban and county areas. 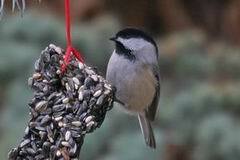 A seed that is favorite to the chickadee is the sunflower seed. Chickadees are also attracted to suet. Chickadees are most commonly found on the edges of wooded areas with deciduous and mixed deciduous-coniferous trees. The black-capped chickadee will also inhabit open woods, parks, willow thickets and cottonwood groves. The small winter flock will start to break up in pairs and leave the group in early spring. The males will then start to define their breeding territories. Black-capped chickadees are monogamous and their bond with a mate will last for several years, if not for life. Together the pair will excavate a nesting site. The nesting site usually is excavated in a tree with a soft, partially rotten wood such as birch. The wood chips produced during excavation will be taken away by the chickadees. The cavity excavation will take 7 to 10 day. The female will then construct the nest out of fur, moss and wool inside the cavity. This will take the female another 3 to 5 days to complete. Eggs are laid within days of nest completion. Incubation of the egg is exclusively done by the female and starts when the next-to-last egg is laid. During the stages of egg laying and incubation, the male often will feed the female. The eggs will hatch 11-13 days after being laid. The female will brood the young birds for a few days after being hatched. After the eggs are hatched the male and female will search for food together for the newborns. The young are ready to leave the nest as early as 12 days after being hatched. For the next 2 to 4 weeks, the young birds will be fed by the parents. The average life span of a black-capped chickadee is 2(1/2)” years.